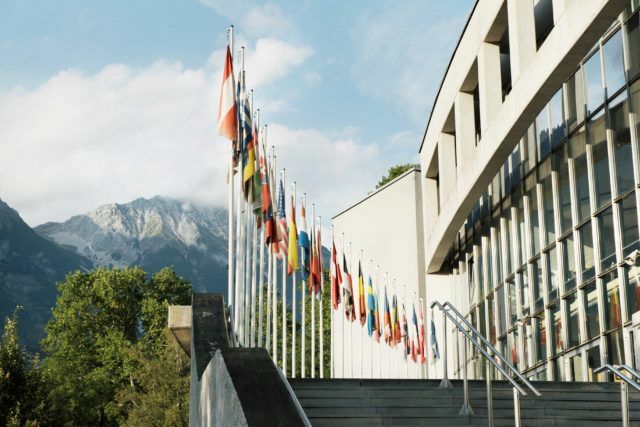 Congress_Innsbruck@cmi.jpg: The keynote speech “From obedience to responsibility” will be held at Congress Innsbruck. For the first time, the management symposium of EVVC is being held in Innsbruck from September 18 to 20. In the buildings of the hosting Olympiaworld Innsbruck and Congress Messe Innsbruck the participating executives and decision makers can look forward to Open Space sessions, marketing Rock ‘n’ Roll by TV chef Stefan Marquard and networking at almost 2,000 meters above sea level. The Innsbruck Olympiaworld (OSVI) and the Congress Messe Innsbruck (CMI) are among the 750 event centers represented by the European Association of Event Centers (EVVC). Some 300 participants and decision makers of conference and event centers and event locations from all over Europe can look forward to interactive experiences and exchange of opinions. “We look forward to a program with trend setting topics related to sustainable events, innovative concepts and practical impulses” says Bielowski. Responsibility as success factor. This is the motto of the two-day program in the alpine metropolis which will open in the Congress Innsbruck with a keynote speech “From obedience to responsibility” by Herbert Salzmann, an Innsbrucker by choice and development consultant. Subsequently, the line-up of this top-class program will include an open space session on leadership styles, hybrid events and social media agendas as well as a parallel plenary session with the key topic focusing on event legislation. Afterwards, the participants can take the funicular from the Nordkettenbahn station adjacent to the conference building and arrive at the almost 2,000 meters high Seegrube for an evening of networking, from where they can also enjoy a stunning panoramic view overlooking Innsbruck and in the entire Inntal. On the second program day the Munich-based corporate consultant Markus Hornung doesn’t leave the stage until the sentence “Emotions have lost nothing in business!” vanishes from the minds of the participants. After further exchange of experience and lunch sessions the German TV and star chef Stefan Marquard manages to catch the attention of the marketing world with Rock ‘n’ Roll and provocations and explains how one can break through the limits with fun, joy and courage. For the final whistle of the 17th management symposium there shall be a networking event in the Innsbruck’s Tivioli stadium. “As one of the leading convention centers in Austria, we are particularly delighted to work together with Olympia World Innsbruck to ensure a successful exchange at the heart of the Alps”, stresses Congress Messe Innsbruck CEO Christian Mayerhofer the initiative for winning the EVVC management symposium for Innsbruck. “Innsbruck has an excellent reputation as a sports, congress and exhibition city. We are pleased to integrate the advantages of destination and location as well as its unique urban alpine flair with short distances, best services and world-famous hospitality into the EVVC meeting“, says Mayerhofer.